Gas pipe laying along overhead corner of external walls. Gas nets layout inside the building in heated spaces. 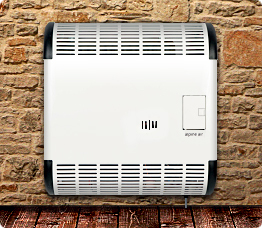 Connection to the gas air convectors which operate only on gas, without electric power. Operating principle of gas convector is based on hot air convection. Coming according to the realized connecting diagram of independent heating gas burns off in closed combustion chamber of air convector and the generated heat passes through the heat transfer unit to the circulated in the room air. Familiarization with gas convector. Operating principle and characteristics.